Bauerfeind's AchilloTrain is a comfortable knitted support with a silicone insert alongside the Achilles tendon and under the heel. An additional heel cushion is provided for the unaffected foot. 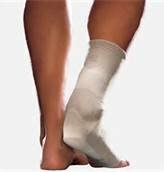 It is designed for Achilles tendon injuries. Knitted Achilles tendon support incorporating an anatomically contoured silicone insert that runs alongside the Achilles tendon. Silicone insert leaves tendon pressure-free and provides intermittent compression for the reduction of swelling and edema. Built-in contour of anatomical knit places ankle in slight plantar flexion. Viscoelastic heel-wedge incorporated to additionally raise the heel for relief of Achilles tendonitis. Additional heel-wedge provided for unaffected foot thus preventing leg length discrepancies. Provides peak shock load reduction to joints and vertebral column with both heel cushions in place. Promotes proprioception, thus heightening sensory awareness in the ankle for increased joint stabilization. Lightweight, breathable knit will not retain heat and is completely machine washable. Can be used for: Achilles tendonitis, Achilles tendon strain, Bursitis of the Achilles, Post-Achilles tendon rupture, Haglunds Deformity, Seiver's Disease. 1: 6 3/4 in. - 7 1/2 in.. 2: 7 1/2 in. - 8 1/4 in.. 3: 8 1/4 in. - 9 in..
4: 9 in. - 9 3/4 in.. 5: 9 3/4 in. - 10 3/4 in.. Point of measurement: Size is determined by loosely measuring the circumference of the ankle at the narrowest point.